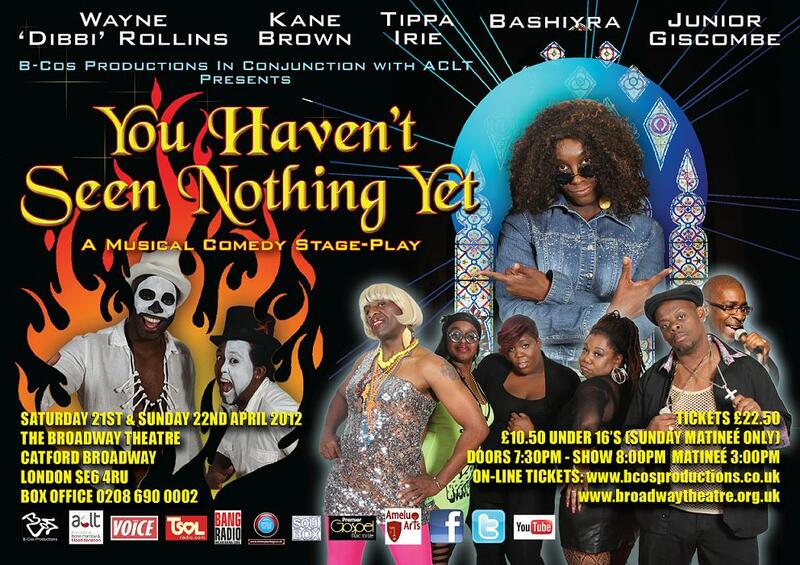 ‘You Haven’t Seen Nothing Yet’ is a family friendly show which debuts in London, at The Catford Theatre, on Sat April 21st and Sun April 22nd 2012. An unusual assault forces singer BASHIYRA to hide-out in a Jamaican Church. Whilst undercover she enters a whole new world, where The Pastor and The Deacon share a secret, the choir is harmonically off key, with multiple and comical personalities all vying for the title of ‘superstar’ and everyone seeming like they’ve had one energy drink too many. A belly-ache musical comedy production featuring a star studded cast inclusive of WAYNE ‘Dibbi’ ROLLINS, KANE BROWN, TIPPA IRIE, JUNIOR GISCOMBE and ORIN LEWIS OBE along with an amazing support cast. This musical comedy is a unique creative precursor approach, designed specifically to further propel the exceptional talents of Bashiyra and capture mainstream attention. In addition to the above, music production has commenced on a number of projects including completion of the official theme tune for the above mentioned musical comedy production of the same name, as well as Bashiyra’s eagerly anticipated sophomore album project on her US based label NuVybe Records headed by Herb Middleton, due for international release in the late Spring quarter of 2012, which sees her writing with Richard Rudolph, the husband of the late great Minnie Ripperton with production credits also extended to Peter Moore (LA Reid). Team Bashiyra vows to make chart -breaking hits for 2012 and beyond. ‘You Haven’t Seen Nothing Yet’ is an engaging storyline topped with the sounds of funk, soul, reggae and gospel delivered live by the fabulous seven-piece MAC Band. The show is in conjunction with the Leukemia and blood disease charity ACLT, with constant need to raise awareness for this cause, the show hopes to raise an ample amount of money. This family show will be filled with laughter and song and will be the platform for some great emerging talented performers. A must see show produced and directed by Cosmo Morgan alongside rising star Bashiyra with hilariously explosive outcomes.